Help is also available via email at e-reserve@northwestern.edu or by calling 847-491-7681. Please note that a library staff member may need to enroll in your course to provide support as needed. Canvas automatically will notify you that the staff is enrolled as "Instructor" but it is actually as the "Support" role. Library staff un-enroll when they have finished. 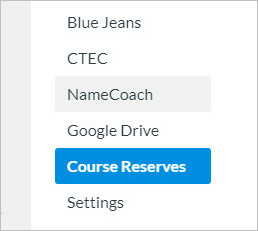 Course Reserve is requested and delivered online through tools in your Course Site on Canvas. Course Reserve materials include PDFs of book chapters and articles, links to articles, streaming audio and streaming video. See the video tutorials and written instructions below. Navigate to the course site in the Canvas. Click on Course Reserves in the left hand navigation, as shown below. This link is available in all courses automatically. The first time the Course Reserves page is opened, please choose the quarter in which the course will be active and click "Create Course." You will see the Course Reserves tool where you can request and view materials for your course.